Swimming is an excellent activity for strengthening the heart and lungs. Swimming is one of the most effective forms of aerobic exercise for increasing lung capacity and improving heart health. However, because swimmers often carry a higher percentage of body fat than other athletes, many women who are mainly concerned about weight loss overlook its value. By incorporating swimming into your fitness plan, you will benefit from full-body toning, a joint-friendly, low-impact workout and enhanced cardiorespiratory fitness. The American Heart Association recommends that all adults participate in at least 150 minutes of moderate aerobic activity each week, which equates to 30 minutes per day, five days a week. With so many activities to choose from, you may wonder what makes swimming unique. Swimmers are at a lowered risk of overheating because water cools the body more quickly than air, which helps to keep your heart rate low. Water's buoyancy also supports swimmers, and the lessened gravitational impact allows the heart to pump blood more easily to working muscles. Finally, swimming helps to train the body to use oxygen more efficiently, which allows swimmers to benefit from an enhanced lung capacity and lower resting heart rates and breathing rates, according to the Harvard Medical School Family Health Guide. Instead of being able to take quick, panting breaths as many do while running or jogging, a swimmer must turn her head to the side to get air. To prevent fatigue if you are new to swimming, make sure you are breathing often and properly by inhaling through your mouth and then exhaling through your mouth once your face is submerged in the water. To increase lung capacity when you are starting out, Harvard Medical School Family Health Guide recommends swimming for short periods -- five to 10 minutes. As your lung capacity improves, begin lengthening your workouts and mixing up strokes -- for example, do five minutes of freestyle followed by five minutes of backstroke -- for maximum muscle engagement. All forms of aerobic exercise help to improve cardiovascular health. However, the unique properties of water ensure swimming places fewer demands on the heart than running or other land-based exercises. For optimal heart health, the University of California at Berkeley recommends swimming laps for 20 to 40 minutes based on your fitness. Incorporate different strokes at different speeds for best results, and pay attention to your heart rate. Your heart rate will remain lower during swimming than during other forms of exercise, so don't be surprised if your target heart rate remains 10 to 20 beats per minute lower than usual. If you are a runner or cyclist, swimming can be an important cross-training tool because it provides a full-body workout while improving lung capacity. Since it places decreased demand on both the heart and the joints, it is an optimal exercise for days between more strenuous workouts or for athletes returning to their sport after injury. When you swim, you need only complete one-fourth the distance you would on land to achieve a comparable workout. However, because swimming long distances can tire beginners, don't be discouraged if you cannot complete a comparable distance during your first or second swim. 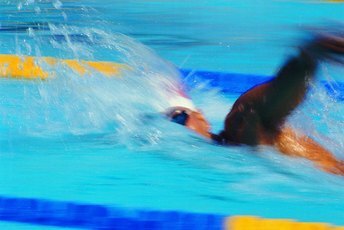 Human Kinetics: Why Choose Swimming? Tiffany Parnell is an experienced writer of health-related articles. She has worked as a copywriter in the health-care, information-technology and finance industries. Parnell holds a Bachelor of Arts in communication with a minor in biology from the University of Tennessee at Chattanooga. Is 30 Minutes of Swimming Better Than Running on the Treadmill for One Hour? What Are the Five Basic Swim Strokes? Does Swimming Elevate Your Heart Rate?